Trump missed a prime opportunity to confront Putin about Russia’s election interference, hacking, cyberattacks, its bloody aggression in Ukraine, the annexation of Crimea, the downing of the Malaysian airliner MH17, the Skripal poisoning on allied British soil, the murder of Boris Nemtsov and the continued imprisonment of multiple Ukrainian activists, including Oleg Sentsov, in Russian jails. Russian state TV promptly pointed out that Trump never mentioned Russia’s aggression, the annexation of Crimea or the Skripal case. Instead, Trump blamed the U.S. along with Mueller, defending himself and Russia. Trump exclaimed: “I think that the probe is a disaster for our country. I think it’s kept us apart. It’s kept us separated. There was no collusion at all. Everybody knows it… People know that. People understand it. The main thing — and we discussed this also — is zero collusion. It has had a negative impact upon the relationship of the two largest nuclear powers in the world. We have 90 percent of nuclear power between the two countries. It’s ridiculous. It’s ridiculous what’s going on with the probe.” When the ball was in his court, Trump chose to drop it. A White House official told the Wall Street Journal, the idea was to “shove [the indictment] in Putin’s face and look strong doing it.” Instead, Trump did “the exact opposite,” appearing to side with Putin over U.S. intelligence agencies by stating he saw no reason why Russia would have interfered in the election. The subsequent correction of “would” to “wouldn’t” didn’t resonate with audiences at home or across the pond. Appearing on Russian state television, Sergey Fedorov, Senior Scientific Associate at the Institute of Europe of the Russian Academy of Sciences, explained that in Helsinki, Trump expressed his true belief and retracted it upon returning to the U.S. solely because he faced harsh criticism. The large audience enthusiastically clapped, endorsing Fedorov’s point of view. Putin proceeded to make an abjectly absurd offer, proposing that Russian authorities conduct the questioning of the 12 indicted GRU members, permitting the Mueller team to travel to Russia and merely watch the questioning. In exchange, Putin requested the questioning of the former U.S. Ambassador to Russia, Michael McFaul, the British businessman Bill Browder, as well as multiple unnamed U.S. intelligence officers. Instead of expressly rejecting Putin’s unpalatable proposal outright, Trump agreed to consider it and lingered for days before it was officially rejected. The summit produced another non-starter, birthed by the Russian side: a proposal to hold a referendum in Eastern Ukraine. Trump’s failure to immediately reject it provided fertile ground for the Russian state TV propagandists, predicting that such a referendum will lead to Donbas seceding from Ukraine and subsequently being annexed by Russia, akin to Crimea. The proposal was finally shot down days later. Ex-diplomat Nikolay Platoshkin says that the referendum in E. Ukraine, offered to Trump by Putin, would be followed by another referendum. Female host clarifies: "First about seceding, then about joining Russia." Trump’s repeated refusal to immediately reject Putin’s unworkable propositions could be explained only by his utter lack of preparedness for this top-level meeting, or the fact that he is unwilling to confront or contradict the Russian leader on any front. The latter would also explain Trump’s puzzling insistence that a large portion of the summit would exclude any aides or advisers. An experienced and cunning politician, Putin could hold his own, while Trump seemingly self-surrendered on every topic. Russian state TV programs explained that Putin had to come to Trump’s rescue by bringing up Crimea, which might have otherwise gone unmentioned. Speaking at Moscow’s Valdai Discussion Club, Russian Ambassador Anatoly Antonov said that “the Ukrainian issue was not at the center” of the Trump-Putin talks. The Russian state media amplified the claim that Ukraine was mentioned “only on the periphery” of the summit. These assertions directly contradict the notion that Ukraine was one of the top three topics of the summit, as one might surmise by reviewing Putin’s notes, conspicuously showcased during the press conference. 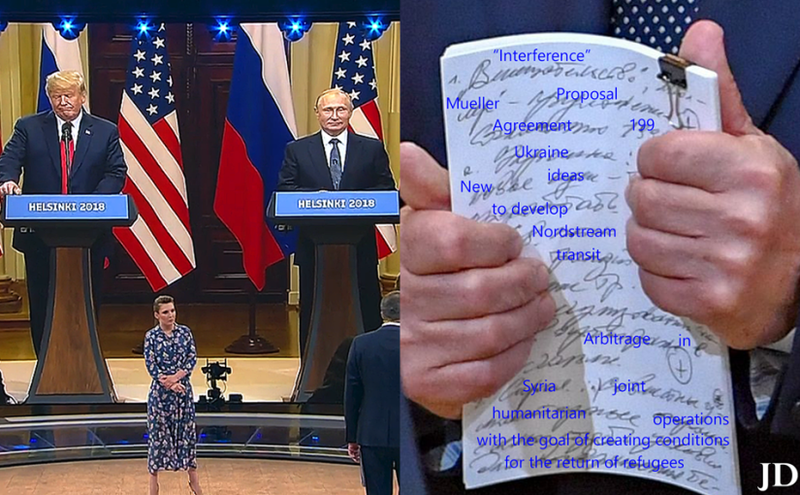 That seems to suggest that the scribbled highlights were contrived as a prop, an optical illusion, meant to convince the world that the summit centered around the most pressing issues of the day. The entirety of the Trump-Putin discussions remains a mystery. Russia claims that agreements were made at the Helsinki summit, while the National Security Council insists that “There were no commitments to undertake any concrete action, beyond agreement that both sides should continue discussions.” Without a formal record of the proceedings, Russian spin masters are propagandizing “useful” verbal agreements, allegedly ranging from joint efforts in the cyberspace, economic cooperation and Putin’s assistance to the U.S. in its anticipated withdrawal from Syria, to the already debunked claims that Trump consented to the Ukrainian referendum. In the Russian state media, Trump is portrayed as the most pro-Russian politician in the United States, willing to make innumerable concessions and fulfill Russia’s long-range goal of destroying the transatlantic unity. In the aftermath of the summit, the Kremlin is achieving its prime propaganda goals, as Russia continues to shape the narrative and Putin positions himself as the most powerful man in the world.